Are you looking for a personalised gift for a special man in your life this Christmas? Whether you are looking for a gift for your friend, partner, dad, or grandad, we have an extraordinary collection of unique presents for males of all ages and for all occasions. Our range of tailored personalised gifts, allow you to personalise the present the way you want. You can customise the gift with his name, a special date, or you can even add a special message to the beautifully handcrafted gift. 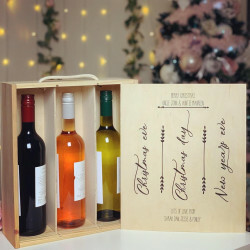 From engraved wooden log slices and bottle opener plaques, to personalised cavases and custom wine boxes, we offer an extensive range of unique gifts for him. Why Choose Our Personalised Gifts for Men This Christmas? We understand the situation when it comes to finding presents for men, as it can be a struggle to find new ideas each year, especially when they don’t give you suggestions. Whether you’re looking for a gift for his birthday, for Christmas, or for any other occasion, you can be sure that we have something that can put a smile on his face. Made With Love and Sparkle is a family run business with years of experience in hand-crafting unique presents for men. That’s why our selection of presents for men is so diverse and varied. Our personalised gift range features gifts for all occasions, including birthdays, weddings, anniversaries, and more. 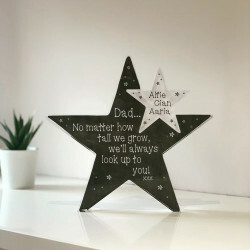 The best presents always involve a personal touch, and with a personalised gift for him, you can show just how much you love or care for him. Just with all of our products on our website, our presents for him can be shipped across the UK, which means that we can deliver your gift straight to your door, wherever you are.